These mid-sized Heartless cause the most trouble when they toot their horns to heal themselves and their cohorts. Block and you can deflect the bouncing fireballs they spew. The Flare Note is an Emblem Heartless that is found in Kingdom Hearts 358/2 Days. 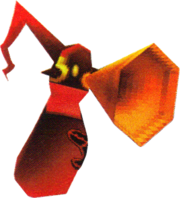 A Flare Note's body is round, dark red, and limbless, with the Heartless emblem adorning its chest. It neck is red and its head sports two glowing, yellow eyes. It also has two short, dark red horns on either side of its head, and a gold pattern decorating its head that resembles headphones. A large, twisted, red horn sprouts out of the back of its head. Its most prominent feature is the large, gold trumpet in the center of its face. "Flare" refers to the Heartless's manipulation of Fire. "Note" references musical notes, which, in turn, is a nod to the Flare Note's trumpet. The Flare Note, like all Heartless in its family, has the power to heal other enemies in battle. Should Roxas get too close to it, it will not hesitate to spit flames. This page was last edited on 6 September 2018, at 22:22.